The quantities for this are really up to you. I've never weighed or measured when making this, I just throw in what I have to hand. You probably know how much sauce you need to make a lasagne in your usual dish so just do what feels right. 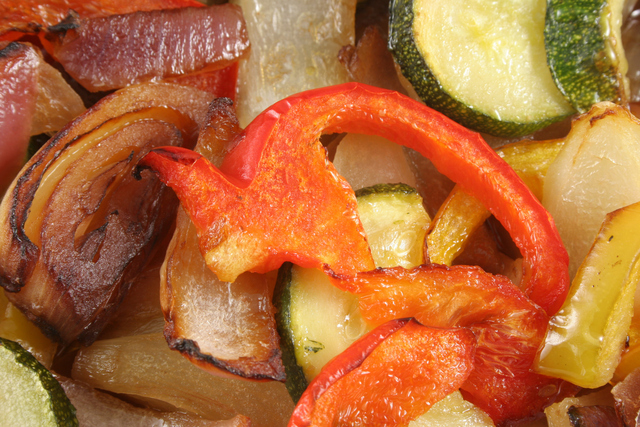 Vegetables for roasting: Courgettes, Aubergines, Onions, Peppers (you can include other things such as carrots too, but remember that they take longer to cook so make the pieces smaller than the rest of the softer vegetables. Cut the vegetables into even sized pieces, not too small but small enough that when you eat the resulting lasagne you will have a couple of different veggies in each forkful. Place the vegetables in a roasting pan, drizzle with olive oil, sprinkle with the crushed garlic and rosemary. Remove the vegetables from the oven, pour in the passata, season with salt and pepper and mix well. There's no need to cook the sauce further, that's it! Now arrange into your lasagne dish, starting with a layer of vegetable sauce, next some white sauce and then the lasagne sheets on top, repeating until the dish is full and finishing with a white sauce layer. Don't be too generous with the sauce in each layer or you'll never fit in enough lasagne sheets and it will be too sloppy to serve easily. Grate some parmesan and some nutmeg over the top and it's then ready to go in the oven. You could keep it in the fridge until you're ready to cook it, or just bake straight away. When you're ready, bake it the oven at 180°c until browned on the top and looking like a tasty lasagne. Probably about 35 - 40minutes.